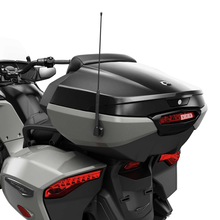 Fits up to two 2XL full face helmets including communication system. Required vehicle color matching side panels to complete the top case assembly - sold separately. Top Case Speakers Ampli er Kit (219400769) is required to play music through top case speakers for Spyder F3-T 2016-2017 & F3 Limited 2016.